Le Menteur Volontaire was created in 1993 and established at La Roche-sur-Yon in 1999 around a core group of young actors. 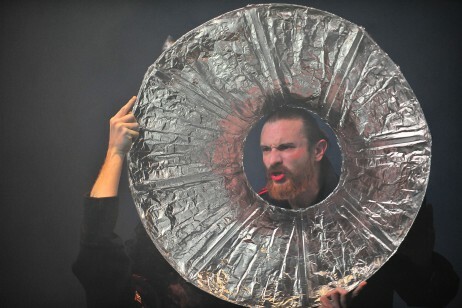 In 2008, Laurent Brethome became artistic director of the company after directing a series of productions. He brought together a team of collaborators and performers who regularly take part in his creations. The company has been funded by the DRAC Pays de La Loire, the Pays de la Loire region and the town hall of La Roche-sur-Yon since 2008. For more information about the creative team click here. Since its founding, the company has endeavoured to attract an audience little or not used to going to the theatre by offering the discovery of classic such as the works of Shakespeare, Feydeau, Dostoyevsky, etc. Laurent Brethome undertakes this venture through the exploration of both classical and contemporary playwrights. From Marlowe, Brecht, Racine and Molière to Minyana, Copi, Levin, Weill, Notte, and so on. His productions are composed of radical choices in which the performers are wholly committed to the dramatic action on stage. The text, the flesh and the breath of the actors create a theatre that unflinchingly presents the contemporary world and the violence of human relationships. Festive, generous theatre – wholly oriented towards the text and the actor. The purpose of Laurent Brethome’s theatre is to paint the world in an enchanting light without losing its more sombre sides. His motto might be “action rather than commentary” – seeking to convey the absurdity of the world in all its emotion, energy and violent intuition as joyfully as possible to present-day audiences. This will has led to the creation of performances taking place in unusual spaces such as mills, factories, bakeries, urban wastelands etc. The company has always engaged in educational activities and training initiatives through debates, discussions, internships, and workshops within and outside of school settings. Laurent Brethome has developed a series of workshops in prisons (La Roche-sur-Yon, Villefranche-sur-Saône, Prison Saint Joseph Lyon) and hospitals. 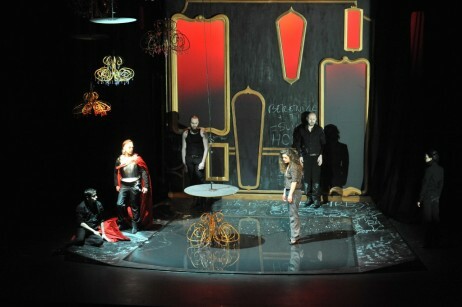 At times this work has resulted in public performances in theatres such as those of Croix-Rousse in Lyon, Villefranche, and in the company’s very own yearly festival Esquisses d’été in 2009. Performers of Le Menteur Volontaire can be found in school workshops all over the country. Laurent Brethome and Philippe Sire (president of Le Menteur Volontaire) are certified performing arts teachers. They are both teachers at the Conservatoire de Lyon, where Philippe Sire is the director of the department of theatre studies.